Get into the Christmas spirit by instilling a bit of rock 'n' roll spirit into your holiday dcor. 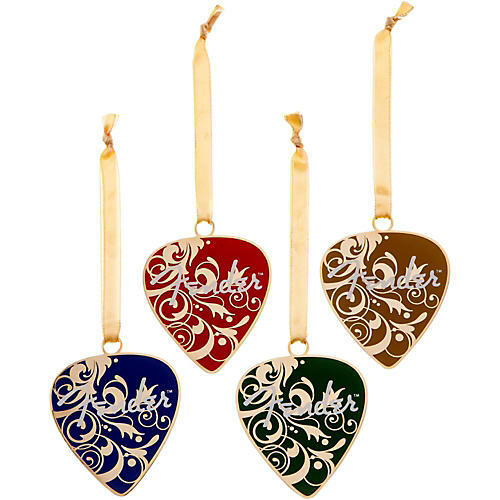 This festive set of four pick-shaped ornaments is sure to blend yuletide cheer with musical flair and a classic Fender instrument features.Measurements: 2" x 1.84"
Get into the Christmas spirit by instilling a bit of rock 'n' roll spirit into your holiday dcor. This festive set of four pick-shaped ornaments is sure to blend yuletide cheer with musical flair and a classic Fender instrument features.